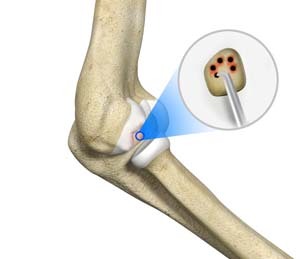 Osteochondral Autograft Transplantation : In this procedure, plugs of cartilage are taken from the non-weight-bearing areas of knee, from the same individual and transferred to the damaged areas of the joint. This method is used to treat smaller cartilage defects since the graft which is taken from the same individual will be limited. Following cartilage replacement, your doctor may recommend physical therapy to help restore mobility to the affected joint.